Now in its second generation, the Vauxhall Insignia is better than ever. 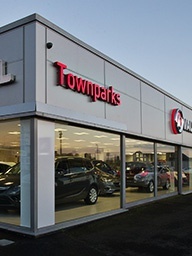 Available in two versions at Townparks Vauxhall – the Grand Sport fastback and Sports Tourer estate, the Insignia is the perfect choice for those who want their driving experiences to be as stylish as they are enjoyable, with the Grand Sport providing sporty attitude and luxury in equal measure. Confidence and an immense sense of presence are at the heart of the Insignia Grand Sport's design. In addition to its instantly noticeable curves, the Insignia stands out through its exquisite details, so you are sure to turn heads everywhere with the confident LED headlights, large alloy wheels and curved lines that put aerodynamics at the forefront of visual design. Get behind the wheel and a world of luxury awaits for you and your passengers. Plush upholstery will excite your senses, while the comfortable seats design will leave everyone relaxed and contented. Practicality comes by default, with 490L of boot space that ensure you won't have to leave anything out on your trips. With a choice of three petrol and diesel engines to choose from, the Vauxhall Insignia delivers the performance that its appearances promise. With all-wheel drive available as well, your Insignia Grand Sport will perform like a dream on motorways and city roads alike. Standouts in the line-up include the frugal 1.6-litre 110PS diesel unit which returns 70mpg and emits as little as 105g/km and the power-hungry 2.0-litre 260PS petrol engine available on selected trims. Choose the latter and you will get from 0 to 60mph in a paltry 6.9 seconds. Standing out has never been this easy. In addition to delivering class-leading entertainment and connectivity through the IntelliLink touchscreen infotainment system, the Vauxhall Insignia Grand Sport makes your life easier through standard features such as Keyless entry, Engine Start/Stop and air conditioning. In addition to the numerous airbags put in place for the driver and passengers, the Vauxhall Insignia Grand Sport benefits from an exhaustive range of exciting safety features such as Adaptive Cruise Control, AEB and a convenient heads-up display. Get in touch with Townparks Vauxhall in Northern Ireland today to learn more about the latest Vauxhall Insignia Grand Sport. Call the phone number displayed or complete the available enquiry form to get in touch with a member of our team.